KEARNEY, Mo. — One by one, Platte County players excited the locker room at Kearney High School welled with emotion on Friday, March 2. The loss to Kearney in the championship game of the Class 4 District 15 tournament, for the second year in a row, was a tough to handle. This one hurt and the tear-filled eyes of players as they exited for the night — and for some the final time as Pirates — made that clear. Platte County players, from left, Uzeal Abraham, Nathan Stanley, John Watts, Deiondre Ragsdale and Lakol Myiral interlock arms while awaiting presentation of the Class 4 District 15 runner-up plaque from Kearney athletic director Eric Marshall (foreground) following a 60-48 loss to Kearney in the championship game Friday, March 2, at Kearney High School. Once down by 20 points, the Pirates had pulled within three possessions late in the fourth quarter but couldn’t complete the comeback in a 60-48 loss. The Pirates, the district No. 3 seed, faced off against Kearney for the third time this season and lost both contest on the Bulldogs’ court. Platte County lost a heartbreaker, 58-57, in January. 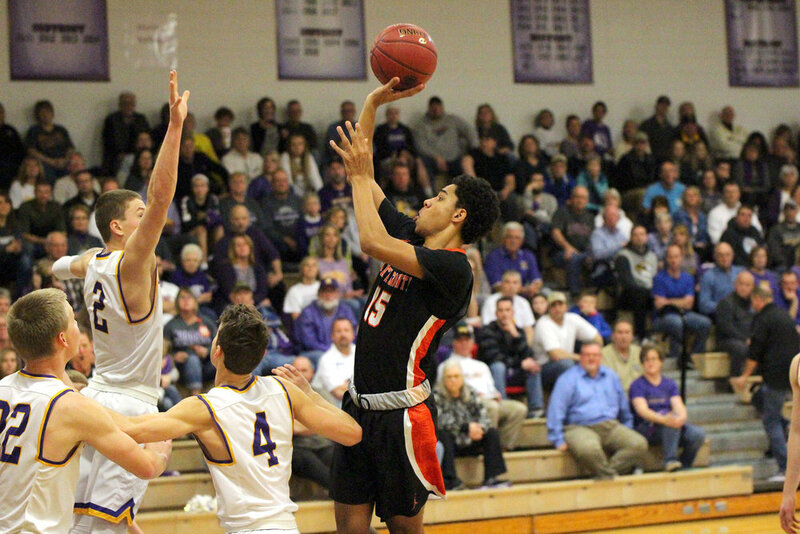 When the Bulldogs visited the Platte County last month, the Pirates were hot offensively and dominated early before fending off a late comeback by Kearney in a 59-51 victory. The third meeting was almost a reversal of the second. Top-seeded Kearney (15-12) came out hot and put the Pirates in a hole they never could fully dig out of. The first quarter was competitive, but the Bulldogs made the move to take command over the two middle quarters. Kearney went up 10-8 after the first quarter on a basket by Jake Huet with 50.9 seconds left. That turned out to be the beginning of a 12-0 run for Kearney and that gave it a 20-8 lead after a layup by No. 3 with 5 minutes, 39 seconds left to play in the first half. Behind Nathen Mair and Ethan Esdohr, the Pirates (13-13) pulled within 20-14 over the next two minutes, but Kearney took a 25-16 lead into the break. “They shot the ball well and we didn’t and we were playing from behind all night long,” Hodge said. Deiondre Ragsdale hit a 3-pointer early in the third quarter to make it a two-possession game, but the Bulldogs answered with an 11-0 run capped by back-to-back 3-point plays. Down 17, Platte County cut the deficit down to 10 with 2:14 left in the frame, but Huffman hit back-to-back 3s to make it 42-26 going into the fourth. A layup by freshman Brennan Watkins two minutes into the fourth gave Kearney a 46-26 lead — the largest of the contest. Platte County then put together what almost was a comeback for the ages. Down 20, Ragsdale scored a basket and added two free throws. John Watts went inside the paint and muscled his way toward the basket for a layup. Mair then drained a 3-pointer that cut the Platte County deficit down to 46-35. Less than 30 seconds later, a pair of 3-point plays gave Kearney a 15-point lead again with less than 4 minutes to play. Platte County never could pull within single digits again and the Bulldogs shot 19 free throws in the frame to help extend the lead and keep the Pirates at bay. Mair scored a team-high 16 points and Watts had 12 for Platte County in their final game. Ragsdale was limited to 7 points after scoring 27 in the semifinals against St. Pius X and 25 against Excelsior Springs in the first round. This marked the second year in a row Kearney beat Platte County in the title game and the third time in the past four years. Kearney won 57-43 in the 2017 version of the district game, while winning the 2015 finals, 50-47. Platte County’s Deiondre Ragsdale, right, shoots a jumper over the outstretched arm of Kearney defender Gunnar Carpenter (2) during the Class 4 District 15 championship game on Friday, Feb. 2, in Kearney, Mo. The Bulldogs beat the Pirates, 60-48. In 2016, Kearney beat Platte County in the first round of the district tournament, 62-44. The Pirates were vying for their first trip to the postseason since the 2009-2010 season. After winning the district title that season, Platte County lost in the opening round of the state tournament to — you can probably see where this is going — Kearney. The Bulldogs, then led by current St. Joseph Benton coach Gary Belcher, went on to win the Class 4 state championship that year. 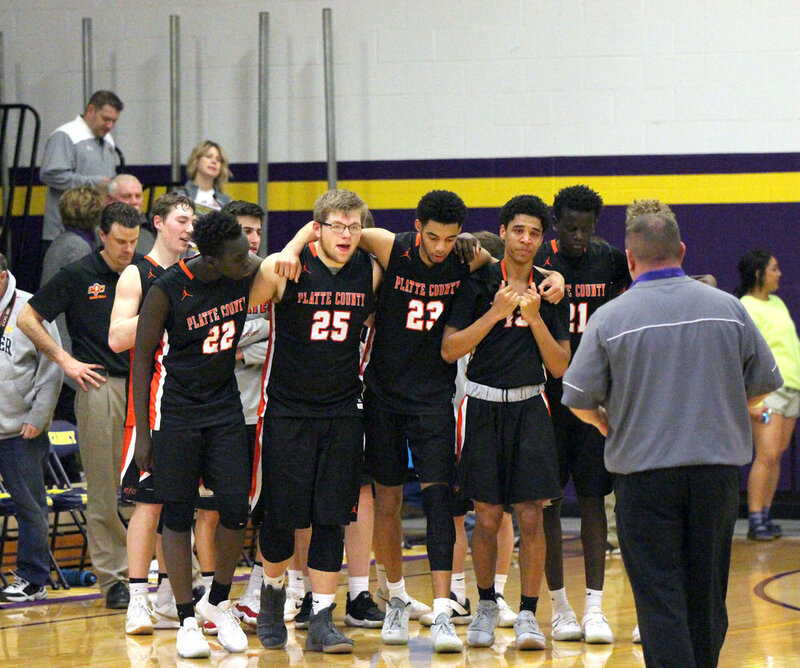 When a season and a career is on the line, a team needs its seniors to step up and provide leadership and that is exactly what happened with Platte County in a 70-68 victory over the St. Pius X in Class 4 District 15 semifinal action on Thursday, Mar. 1. Pirates coach Rick Hodge received 62 points from his seniors — Deiondre Ragsdale, Jon Watts, Lucas Stanley and Nathen Mair. Ragsdale led the way with a game-high 27 points and Watts (15 points) and Stanley (13 points) joined Ragsdale in double-figures. The Pirates, who led for much of the game, needed some clutch fourth-quarter baskets to pull away from the Warriors, who knotted the score early in the final quarter. The Pirates held a 54-50 lead opening the final-quarter, when the Warriors opened the quarter with two-quick hoops by seniors Johnny Conforti and Andrew Hipp tying the score at 54-54. A mere 15 seconds after the Warriors — the No. 2 seed who entered with a 15-9 record — tied the game, Stanley went on a scoring flurry. It started with a three-ball from the left wing with 6:42 left in the fourth quarter pushing the Pirates ahead 57-54. Then following a defensive stop, Stanley scored again this time with a chip-shot from inside the paint as he stretched the Pirates lead out to 59-54 with 6 minutes, 32 seconds remaining in the final quarter. Stanley’s mini-run gave the Pirates the boost they needed, but the Warriors didn’t go away. Warriors junior guard Kyle Taylor, who finished with 13 points, came down the floor and provided a 3-point play for his team at the 5:30 mark drawing the Warriors within two. However, the Pirates had an answer when junior guard Ethan Esdohr added two of his seven points, following a drive to the rim at 3:52 stretching the Pirates lead to 61-57. Watts, added the next three points for the Pirates, but another basket by Taylor pulled the Warriors within 64-59 with 1:21 left. Watts scored again, when Ragsdale assisted him on an easy bucket under the rim, and just like that the Pirates were ahead 66-59 with a minute to play. After coming up empty, the Warriors went into foul-mode placing Ragsdale on the charity stripe where he converted both attempts for his only points of the quarter helping his team go up 68-59 lead with 48.1 remaining. Taylor added six points and Conforti added a triple — part of a team-high 26 points — to keep the Warriors in it, but a pair of free throws by Mair with 9.8 left on the clock were enough for the Pirates in the victory over the Warriors. Ragsdale started the game with a flurry in the first quarter. He dropped in 13 of his 27 points in the opening quarter. He connected on three treys including one from the left-wing at the buzzer, pushing the Pirates ahead 19-17 after one quarter of play. Ragsdale continued his high-scoring output with another double-digit scoring quarter in the second. This time, he poured in 10 points, but he left the heroics to Stanley, who closed out the quarter with a crucial second-chance basket giving the Pirates a 39-31 lead at halftime. The Warriors’ began chipping away at the Pirates lead in the third quarter with a 20-point quarter. The catalyst for the Warriors was Conforti, who poured in eight points moving his team within at 54-50 with a quarter left.